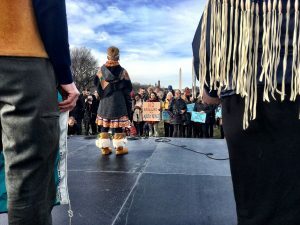 Native Americans and environmentalists rallied to stop and Arctic Refuge bill. Photo: Liz Ruskin. After 40 years of fighting about it, Congress is on the verge of opening the Arctic National Wildlife Refuge to oil development. The U.S. House passed an ANWR measure Tuesday in its tax bill. The Senate is likely to pass it shortly. Then the bill goes back to the House for one more vote Wednesday before heading to the president for his signature. Assuming all goes as expected, this is a major win for Alaska’s congressional delegation, and a big loss to environmental groups. Conservationists were able to defeat all previous ANWR drilling bills. Why they were powerless to stop this one? Thousands of protesters rallied Dec. 6 on the north side of the Capitol grounds. But ignore that huge crowd, because it has nothing to do with the Arctic Refuge. That was about immigration. Bernadette Demientieff, a Gwich’in leader, speaks to Sens. 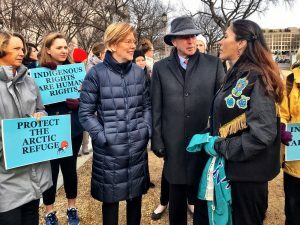 Warren and Udall at an anti-drilling rally. Photo: Liz Ruskin. Few reporters were watching. The mood was somber. It’s a stunning reversal of fortunes for environmentalists. They won so many times on the Arctic Refuge, some years they seemed almost invincible. To see how hard it used to be to convince Congress to allow drilling in the refuge, look at 2005. That year, the political climate seemed perfect for oil development. For the first time, average gas prices soared above $2 gallon. America was importing more petroleum than ever. And U.S. troops were fighting in Iraq, a war many said was about oil. So the argument that America needed ANWR’s oil, that had some pull. Stevens was crushed when he didn’t have the votes to keep ANWR in a Defense spending bill. He had attached billions of dollars to the drilling measure to win votes. Billions to help victims of Hurricane Katrina, to fortify the borders, to help low-income families. In a dramatic, bitter speech on the Senate floor, Stevens told his colleagues he had funneled money so elaborately, the feat could never be repeated. Stevens had that much sway over the federal budget, and it wasn’t enough. When conservation groups won the 2005 round on the refuge, the Sierra Club’s Melinda Pierce suggested that might be the end. “If Stevens failed to get his pet project done, with all the stars aligned – high gas prices, war in Iraq, Republican control of all bodies of Congress – it’s going to be hard for him to get it done ever,” Pierce said. Fast-forward 12 years. Pierce is still at the Sierra Club, only now she’s losing on ANWR. Pierce says this year the refuge fight is overshadowed by other controversies, including the specifics of the tax changes. “The traditional grassroots power that we have always been able to mobilize, really may not be able to break through that huge amount of money and lobbying interest that’s happening,” Pierce said, referring to moneyed interests trying to win changes in tax law. Also, there are fewer members of Congress environmental groups can direct that power to, fewer moderate Republicans. Tiernan Sittenfeld is senior vice president of government affairs for the League of Conservation Voters. Photo via Twitter. This time, 11 House Republicans wrote a letter asking for ANWR to be removed from the tax bill, but six voted for the bill anyway. Retired lobbyist Roger Herrera doesn’t know why ANWR is passing now, and so quietly. “The frustrations over the last 20 or 30 years, political frustrations, with trying to open the coastal plain have been pretty extreme (at) times,” Herrera said. Herrera worked to open the refuge for most of his career, first for BP, then as director of Arctic Power, an ANWR-drilling lobby that was active for more than two decades. The state of Alaska spent about $12 million on Arctic Power over the years, to fight for votes in Congress. The group has been dormant for a few years, but ANWR is passing anyway. Herrera wonders if environmental groups just quit trying so hard. “In a way, one doesn’t mind how it happens,” Herrera said. Environmental groups insist they’ve given it all they’ve got. Sittenfeld says League of Conservation Voters planned to work the Hill to the last minute. 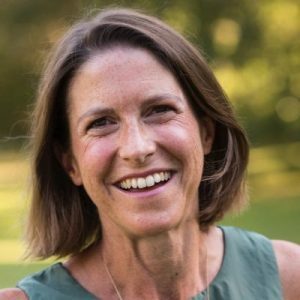 Even if the bill is signed into law, environmentalists say they’ll fight on, with lawsuits, pressure on oil companies or maybe, Sittenfeld said, a new bill in Congress.